Songs 1, 2, 3, 4, 7 were recorded in Soundtrade Studios Solna 1986. All songs were recorded and mastered by Alar Suurna. Songwriters and musicians: Rowland Alex, Tommy Mikk, Andy Olson, Ray Alex, Johnny Oyster. Song 5 was recorded in Europa Film studios 1985. Songwriters and musicians: Rowland Alex, Tommy Mikk, Andy Olson, Ray Alex, Johnny Oyster. Songs 6, 7 was recorded in Nyköping recording 1987. Songwriters and musicians: Rowland Alex, Tommy Mikk, Andy Olson, Ray Alex, Jonas Edler, Jonas Wikström. Song 8 was recorded in RCA Electra 1988. Songwriters and musicians: Ray Alex, Jonas Sandkvist. Songs 9, 10 was recorded in "unknown". Songwriters and musicians: Jan Granvik, Mats Förare, Björn Melander, Ray Alex. Songs 11, 12 was recorded in "unknown". Musicians: Jan Granvik, Mats Förare, Björn Melander, Ray Alex. Songwriters: Rowland Alex, Tommy Mikk, Andy Olson, Ray Alex, Johnny Oyster. 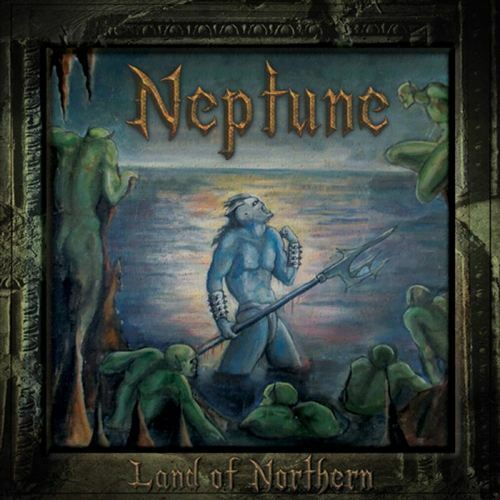 Δελτίο τύπου: «Neptune need no special introduction. Widely considered by most heavy metal gurus as one of the best unsigned Epic Metal bands from Sweden in the 80's. With an image and song writing style like a cross between Heavy Load and Manowar, the band penned some great classic heavy metal tunes and managed to gain a cult status among demo collectors and underground metal fans around the globe. Thanks to Swedish metal guru and guitar wizard Janne Stark, we made a recording deal with the band and we agreed to reissue their 13 classic songs on vinyl and CD, with the CD version estimated to come out by February of 2018. The album will be entitled "Land of Northern" and it will be a fantastic 16 page limited special edition, featuring remastered sound, song lyrics, band photos and story and original fantasy cover artwork. METAL BLOGGER 16 Απριλίου 2018 - 11:26 π.μ. Ότι έχεις ποστάρεις από αυτούς μου αρέσει αλλά το άλμπουμ δεν το έχω ακούσει ακόμα. BALADEUR 19 Απριλίου 2018 - 8:48 μ.μ.